PEOPLE in Denver like to say that while New York may be an experiment that is over, their town is one in the making. That’s the sort of spirit that moved Karl Kister, a philanthropist and entrepreneur, to become involved with the Museum of Contemporary Art/Denver. The Museum of Contemporary Art/Denver. It was spring 2001, and he had just moved from New York, after resigning as chief operating officer of an Internet start-up. He and his wife, Mary Caulkins, were itching to become part of Denver’s cultural scene, when he happened across a show being installed at the institution, which had been mounting exhibitions for only about two years and was temporarily housed in a converted fish market.“I literally knocked on the window and asked if they needed help,” he recounted. “They said, ‘Sure, you want a paintbrush?’” Mr. Kister, amused, agreed. While working, he asked so many questions about the museum’s development plans that the newly hired director, Cydney Payton, was called downstairs to meet him. A few months later, he joined her board; by 2003, he became its president, and the board decided to take its modest institution global. That involved creating a $3 million endowment, putting up a new building and nabbing a star architect — quite a stretch for a museum that at the time had only six employees. On Oct. 28, that dream was realized when the new museum opened to the public in a vibrant loft neighborhood. A smoky glass prism with translucent interior walls, it has attracted international attention because it is the first American project for David Adjaye, a British architect born in Tanzania who is known for his minimalist style and international roster of artist clients. The museum is also on track to be the first museum to win a gold LEED (Leadership in Energy and Environmental Design) rating from the United States Green Building Council. So how did this tiny institution pull off such an ambitious project? 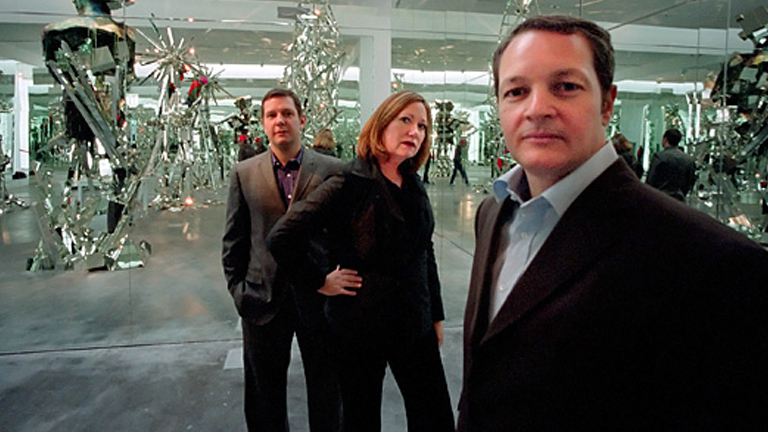 “The time had come for a city like Denver to have a contemporary art museum,” Mr. Kister said. Ms. Payton concurred. Like many other cities in the West, she noted, Denver has an abundance of wealth, a lively contemporary art scene whose legacy has been largely overlooked by art history and a population whose civic pride is strong enough to want to put that right. Mr. Kister is one such transplant. So is his friend from prep-school days, a developer, Mark Falcone, who has also joined the board. “Denver is one of the newest major settlements in the United States, and it’s still being formed,” Mr. Falcone said. “People see opportunities to participate in shaping it.” (He should know: his star project is the redevelopment of Union Station in Denver. ) In 2003, he and his wife, Ellen Bruss, decided to participate by donating a plot of land, later appraised at $1.5 million, for the Museum of Contemporary Art’s new home. The lectures were held on six Mondays in February and March 2004. “I thought I’d be happy if 150 people turned up,” Ms. Payton said. But to everyone’s surprise, the first lecture drew more than 500 people, almost double the hall’s capacity. Later talks, held in a converted synagogue, pulled crowds up to 900. The plans were also posted on a Web site, which drew comments from nearly 5,000 people. As Ms. Payton put it, “It just became the thing to do.” (The lecture series also became a singles scene: one couple who courted there are about to become major donors.) The architects were grilled by two more selection committees — one comprising architecture students from the University of Colorado at Denver, and the other of high school students from P. S. 1, an alternative public school. One P. S. 1 student, Ian Ruskey, was chosen to introduce Mr. Adjaye, the museum’s architect, at the groundbreaking in May 2006. Now a college freshman, he remembers the experience fondly. As Ms. Payton pointed out, the process also gave them “a bit of market research.” Once Mr. Adjaye won the commission, the board decided to start raising money without the usual feasibility study. Using this groundwork, Mr. Kister started an $18.6 million capital campaign in June 2005, aiming it at board members, “people within the community who had an affinity for what we were doing,” and others who had been impressed by the selection process. As of early this month, the museum had raised about 83 percent of the building’s $15.9 million construction budget, and 33 percent of the $3 million goal for the endowment. It also won the Colorado museum brass ring, a gift of more than $1 million from the Vail collectors Kent and Vicki Logan. But perhaps the most positive outcome for the museum is that it has generated strong support. Since the lectures, the volunteer pool has quintupled to 150, and memberships have almost quadrupled, to more than 2,700.